POLITICAL HACKING UNBOUND AND UNLEASHED! The official twitter account of news channel CNN was hacked this evening, by a group calling themselves the Syrian Electronic Army. Several anti-US messages were posted. Around 5:45p.m. EST, CNN’s account began tweeting out messages such as “Syrian Electronic Army Was Here… Stop lying… All your reports are fake!” and “Obama Bin Laden the lord of terror is brewing lies that the Syrian state controls Al Qaeda.” At one point some tweets were deleted before more followed. The Syrian Electronic Army is a group of computer hackers who align with Syrian President Bashar al-Assad. They have previously hacked the Twitter accounts of the Associated Press, NPR, and BBC, among others. 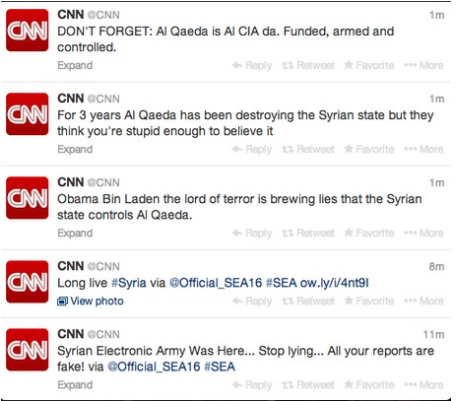 The group appeared to have commandeered a Hootsuite account used by CNN for posting updates on Twitter, posting messages that accused U.S. President Barack Obama (identified in a tweet as “Obama bin Laden”) as being “the lord of terror” who defamed Syria by allegedly asserting that the country was being controlled by al-Qaeda. The hackers also posted messages accusing the CIA of funding al-Qaeda. The Desk reached out to the SEA for comment. CNN has not yet addressed the compromise.